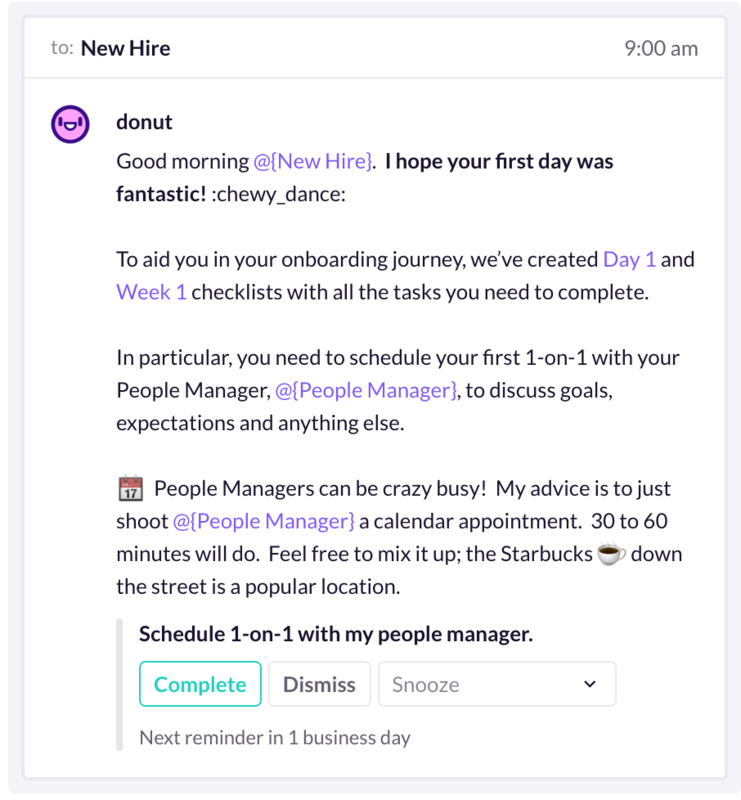 Onboarding isn’t just for learning a role: It’s for introducing new hires to your people and culture. Here’s how Slalom St. Louis does it. Introducing your newest employees to their roles, their colleagues, and your own company’s culture is a tough process to build and coordinate, no matter whether they’re co-located or remote. But what if you only had a short time (a day, a week, it varies) until your new hire left your office completely to immerse themselves in a client project, and didn’t step foot back into your office again for up to six months? That’s the challenge that Slalom St. Louis faces. Like many consulting companies, the Missouri branch of this renowned firm is used to welcoming new hires in the door, and waving goodbye just as quickly, sending them off onto client projects that often last for months. Onboarding for Slalom isn’t just about acclimating the new hire to life at Slalom—it’s about keeping them connected, even when they’re immersed in life at another company for months at a time. Despite explosive growth (the Missouri office has nearly doubled in size over the last six months!) and a constant rotation of employees on and off projects, Slalom’s managed to create and maintain an award-winning culture that’s garnered recognition like Fortune’s 100 Best Companies. How do they do it? Talent Acquisition Analyst Eastin Shipman let us in on a few of their most impactful strategies. As a management consultancy, Slalom has always practiced—and known the value of—a people-focused philosophy. Eastin observed, “We’re into tech and AI, but you can’t replace people.” That people-focused philosophy is evident in one of their most effective tactics for keeping Slalomites connected: the #lunch-pals program. It keeps the team linked whether they’re “on the bench” (read: in between projects) or working with a client. One crucial part of the #lunch-pals success is that it’s open to everyone, from the longest-running veteran to absolute newbies—and Slalom makes sure to include a heads-up about joining the program to all new hires during onboarding. 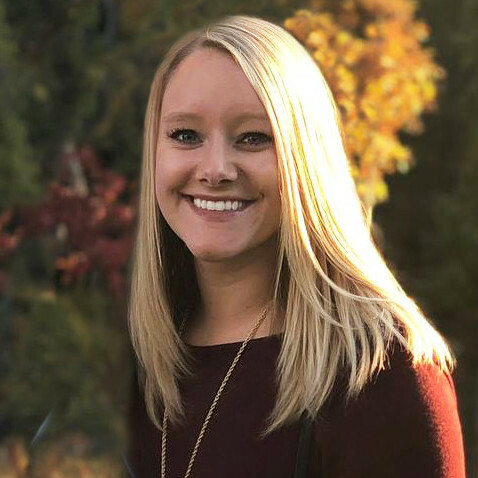 Ask Eastin what her #1 tip for onboarding new hires is, and she’ll tell you it’s making meaningful connections rather than just throwing facts and figures at new hires. Meeting lunch pals is one important tactic to keep all Slalomites connected, but building relationships intentionally for new hires in particular is a critical part of their onboarding strategy. Enter Slalom’s Tandem Buddy Program, which is designed to build meaningful long-term relationships with one person, rather than introducing Slalomites to a wider network. Through the Tandem Buddy Program, every new hire is assigned a buddy from a roster of veteran employees that are presently in the office for lunch, coffee, and questions during the week they start. Though the introductions are similar, these Tandem Buddy relationships are nurtured in a completely different way than #lunch-pals. Case in point: Though Tandem Buddies is continually evolving, Slalom has experimented with all kinds of encouragement and accountability checks, from automated Donut check-ins every week to monthly challenges that keep buddies engaged and add in an element of friendly competition. In Slalom’s case, it’s particularly important to be providing new hires with information on an ongoing basis, because they might be in Slalom’s offices for a week or a day before heading off on a project for up to six months. When they return, they begin the process of learning all over again, from absorbing cultural norms to finding the copy paper. With a schedule of hundreds of employees constantly rotating onto and off of the bench, it’s literally impossible to keep track of who knows what. Slalom’s solution is to steadily send bite-sized tips to new hires over their first few months with the company. These tips range from big picture (think a Day 1 checklist) to those little things everyone can forget but needs to know (like when those weekly fridge purges happen). 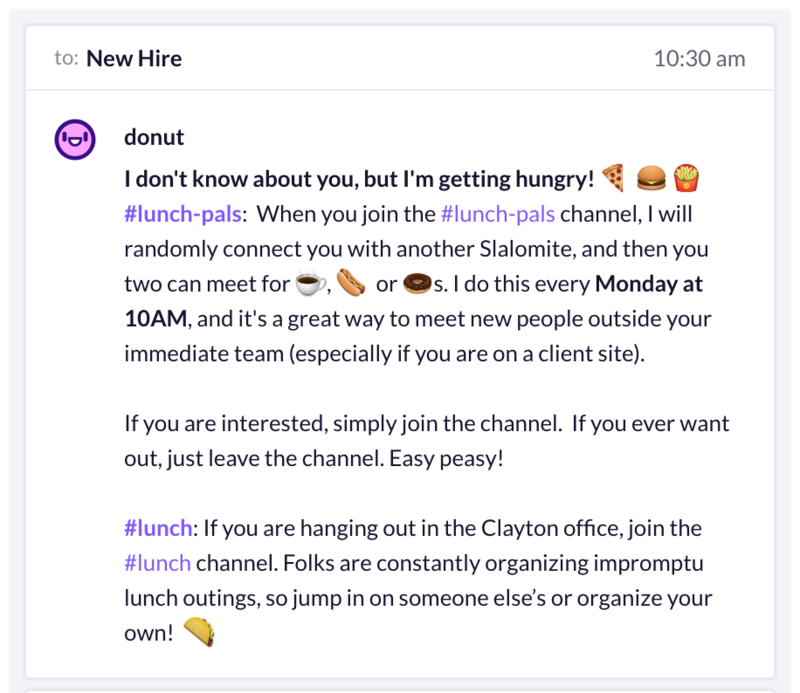 These bite-sized tips are automatically sent via Donut at strategic intervals during the new hire’s first 100+ days, so Eastin can cross information distribution off her list and focus on more important things like the candidate pipeline. At some other consultancies, being “on the bench” comes with a touch of stigma. But at Slalom, being on the bench is a good thing. Eastin says they actively encourage Slalomites to take time for their families, to participate in hobbies outside of work, and to make the most of their bench time. To that end, Slalom structures people management in a way that creates a shared sense of ownership and initiative. They encourage speaking up to request gluten-free chips at a weekly office meeting, and love to see employees hosting lunch-and-learns to share knowledge with each other. The constant streams of feedback and self-planned enrichment activities make it okay for new hires to dive into the deep end from Day 1—and that sense of ownership helps them acclimate that much faster.